Campbell Scott, CCN’s co-founder, left a comment on REDD-Monitor, consisting only of a link to the Journalists Ethics Code for Belarus. I have for a long time have been an avid reader of redd-monitor where i was able to keep up with the industry. False accusation of being a pyramid scheme. No one is forced to recruit and there is no payment for recruitment. Money goes to acquisition of carbon credits amongst other things. The accusation of CCN being a fraudulent pyramid scheme is libelous and wrong we have been scrutinized by the Direct Selling association and various government bodies in this regards and have complied with all rules and regulations to date..
​The accusation that we claim a carbon credit value is $664​ is also wrong. 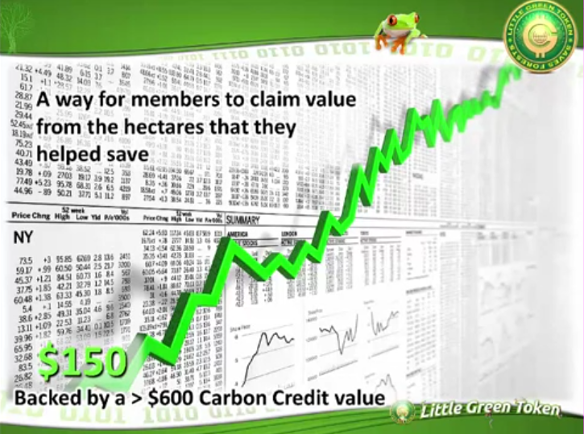 We do not claim this at all, we merely point out that a recent study showed that the social and economic benefits derived from producing a carbon credit according the report is shown to be $664. Another wrongful accusation that that a hectare of forest will only produce a certain amount of carbon credits once ever, is also wrong. A hectare of forest will produce carbon credits every year. Not just once only as this article would have us believe. A conservation project that produced just 300 carbon credits for the life of the project (say 30 years) would be financially impossible to fund. This is a complete fabrication and a lie. ​All in all this article has so many untruths, inaccuracies and malice i am at a loss how an article such as this could be published, not to mention wild and damaging comments that have been generated because of this article.. I believe that i have sighted enough of a reply here to have this slanderous article taken down please and the author reprimanded for publishing such a defaming article. In fairness i have not resorted to threats and lawyers and hope you will see the facts and truth in this reply. Pure PONZI SCHEME as non existent product (carbon credits) can’t generate any network income. Scott, what acquisition of carbon credits, project which you proposed in your presentations were ether stolen or non existent! Commissions not paid to ‘chosen country members’ for the last year, sold company’s shares worth 0 and company assets worth 0! Latest update from CCN management was selling these valuable assets by February 2015 on Canadian auction. Scott, many people are not so naive as you suppose/ expect! BEWARE of these two big scammers as their previous history is very shadow. 1. CCN has not payed the promised MLM provisions for last 12 month to hundreds of CCN members. 2. CCN only incomes were the members investments. 3. 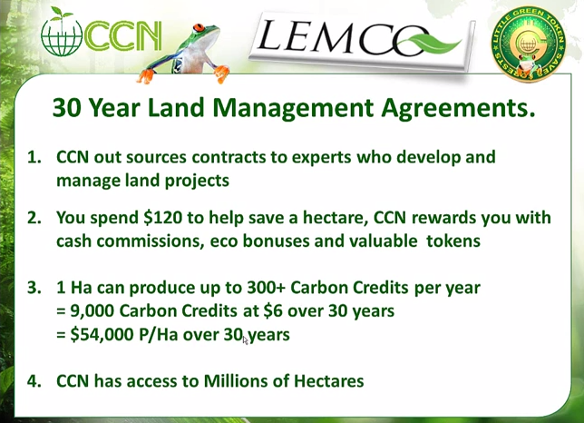 It does not exist any evidence of any CCN carbon credits in status delivered or primary. 4. CCN sent CCN members this fact sheet: http://www.ie-we.com/ccn/asic/ccn_funcadec_projects.pdf in 04/2014. The REDD project in Zaragoza, Columbia is in status: PDD submission to VCS !!! CCN members have found out this REDD project has no PDD, even no PIN and Letter of Acceptance from Colombian authorities. So thank you, Mr. Chris Lang, for warning, your article is very useful for potential investors into CCN carbon credits and worthless Little Green Tokens. I am surprised no one exposed Juraj Adamovic in here. Juraj, as the “head of Sales” in Slovakia had to know what is going on behind the curtains. On the other hand, I met him in person only once.. he seemed so naive it was unbelievable. Such people are always easy target for frauds like CCN, but in this case, Juraj is a part of it and should be exposed. Scammers Erminio Kotlar and Campbell Scott! Pls be very careful regarding these 2 people: Erminio Kotlar, Adelaide, South Australia and Campbell Scott, Perth, Western Australia. They are top scammers!!! Here is an answer for you, Scott.